- Publisher In Dr. Swan's Prescriptions for Job-itis, funny man Dennis Swanberg sets out "to make you chuckle a little and think a lot" about how things are really supposed to work in the workplace. Sincere yet splendidly silly, this is not the kind of doctor to be stuck with in a medical emergency. But he will help you move on with your career and your life. Book jacket. 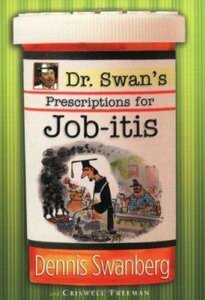 About "Dr Swan's Prescriptions For Job-Itis"
In Dr. Swan's Prescriptions for Job-itis, funny man Dennis Swanberg sets out "to make you chuckle a little and think a lot" about how things are really supposed to work in the workplace. Sincere yet splendidly silly, this is not the kind of doctor to be stuck with in a medical emergency. But he will help you move on with your career and your life. Book jacket. Swanberg graduated from Baylor University. While serving local churches, he earned two degrees from Southwestern Seminary, topping off his education with a Doctor of Ministry. Freeman is a Doctor of Clinical Psychology.